In any home, the bedroom is a special space. It should be comfortable and beautiful to the person who sleeps there, no matter what their personal style. The bedrooms in this post have each been carefully designed and decorated with attention to every detail. The resulting rooms are objectively gorgeous with splashes of personality, amazing awesome furnishings, and enviable aesthetics. This first room features a simple, low profile bed with lots of clean, white details. The wall behind the bed has a unique wavy texture which turns it into a cool makeshift headboard. The use of wood in this bedroom makes it feel very cozy, from the awesome wood closet to the on-theme tree art behind the bed. Here we see two different visualizations for the same room, one that showcases colorful pop art while the other utilizes more subdued tones – swan chair replaces the more reserved Bertoia Diamond, sunken bed changes to a very flamboyant yellow one and sinks, lamp shades & mirrors all match the more vibrant mood. This funky bedroom offers plenty of creative storage options from a wooden display case on the wall to some cozy nooks underneath the bed. This ultra-modern room uses a monochromatic palette to great effect — the space feels large, open, and neat. This sunny bedroom uses wood – on the floors, cabinetry, and furniture – to create a warm and welcoming feeling. The amazing custom bed frame is certainly the focal point of this bedroom, which also features a cool accent wall and shiny marble floors. The huge windows in this bedroom let whoever spends the night get up close and personal with the pretty views of nature, while an en suite bath is quite convenient. Great design can be simple. With wood floors, a headboard bookshelf and couple simple seats, this bedroom has everyone you need and nothing you don’t. Tending more towards a feminine style, this bedroom uses splashes of teal and coral for a beachy atmosphere. By attaching reading lamps directly to the wall behind the bed, the designer of this bedroom has opened up more space while still letting the room feel complete. This large bedroom has everything a guest would need to be comfortable from plush bedding to wide windows and a quiet reading area. The bright green walls in this small bedroom, with an elevated bed, give it loads of personality. This gorgeous modern bedroom uses clean, simple lines and neutral tones to create a relaxing space. More neutral tones and a plush white carpet, complete with a personal vanity area, make this bedroom very inviting. Light wood and simple furnishings make this room feel even sunnier. The creative use of shelving in this compact room make it stylish and practical. With a tufted headboard and matching armchair, this spacious bedroom is fit for royalty. The wood paneling in this small room contrasts with the cool swirling wood pattern on the floor for a bit of fun in an otherwise simple room. The subtle red accents in this almost industrial room really give it a masculine pop. From creative chairs to truly unique light fixtures, this room is entirely minimalist and quite fashionable. The cement walls and cool window treatment in this industrial bedroom make it feel like a modern bunker. Cool grays and black and white artwork establish this bedroom as a creative retreat. Area rugs manage to separate areas of this large bedroom so it feels like more than one useable space. 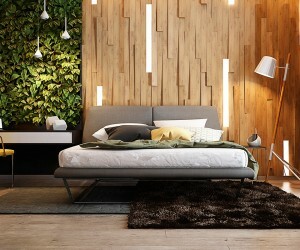 This small bedroom uses texture and reflection, to make the room feel comfortable and spacious. В интеренете нашел важный web-сайт с информацией про https://yarema.ua.